The purse for the Brock’s Performance Street E.T. class at ALL MIROCK events is $1,000 to win, $300 to runner-up, $100 to semis, $50 to 1/4 finals, and $25 to 1/8 finals. Entry Fee is $50 (one-day) or $80 (two-day). 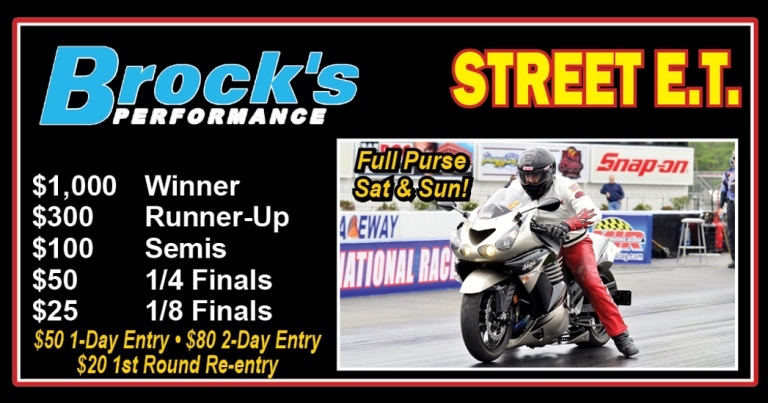 The 2013 brochure for MIROCK events at MIR & Atco that was just mailed out to the mailing list still has last year’s purse and entry fees on it, and we apologize about that typo. So, yes the purse is now $1,000 to win in Street E.T. and we wish everyone good luck in the upcoming 2013 season.